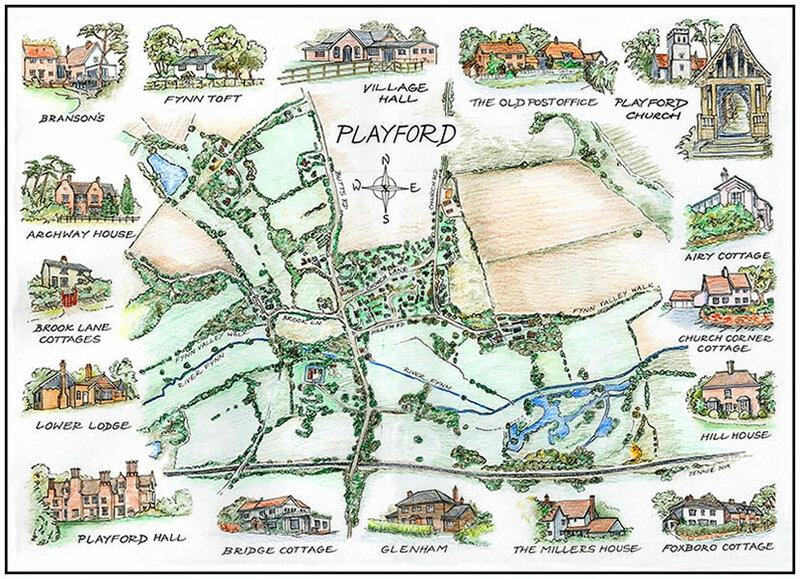 To complement the lovely map, the Village Recorder and Historian Brian Seward is compiling a history of each featured house. This is quite a task but for the moment if you click on Archway House, Airy's Cottage, Foxboro Cottage, The Miller's House, Glenham, Bridge Cottage, Church Corner Cottage, Lower Lodge, Glenham, Hill House, Brook Lane Cottages or Playford Hall on the map there is a comprehensive description of their history and origins. Please note that some of the files (particularly Archway House and Airy's Cottage) are large files and will take a while to download. Keep checking from time to time for updates on the other houses. Thomas Clarkson. He was born at Wisbech on the 28th March 1760. In this town there is a large monument in memory of a man who devoted his life to the abolition of slavery and became known as The friend of slaves. Whilst at Cambridge University he entered and won first prize for an essay on Is it right to make slaves of others against their will? In the year 1785 as a result of his investigation he resolved to fight slavery. In the following year he met Wilberforce and was able to give him facts which he had ascertained through enquiries he had made of skippers at Liverpool and Bristol, that 100,000 slaves from West Africa were exported annually, 60,000 of whom were transported in British ships in appalling circumstances, chained and manacled, flogged and ill-treated. In 1787 the society for the Abolition of the slave trade was formed. Wilberforce was to tackle it in the House of Commons whilst Clarkson was to obtain the evidence. For the next 7 years he went round the country on horse back getting evidence often at a great danger to himself and writing many letters to get support. He then became ill and it was not until 1804 that he was able to start work again. Three years later the bill for the abolition of slavery was passed by Parliament but it was not until 1833 that slavery was abolished throughout the British Colonies. He married Catherine Buck in 1796. It was in 1816 that Thomas Clarkson settled at Playford Hall and lived there until his death 30 years later. Arthur Biddell and his wife used to meet regularly on a Sunday evening to discuss matters with the Clarksons. In 1821 Queen Marie Louise of Haiti arrived at the Hall with her 2 daughters as guests of Clarkson. She was the wife of Henry Christophe a West Indian who led a revolt by the slaves against the French. He was formerly a waiter and appointed himself King Henry. To Clarksons dismay his guests settled down and showed no inclination to move. They remained for nearly a year until the Suffolk climate came to the rescue. The Queen developed rheumatism and one of the princesses contracted bronchitis and they departed to the warmer climate of Italy. In 1838 he received the honour of the Freedom of the City of London. He died on 26th September 1846 aged 87. At his funeral at Playford, Lord Arthur Hervey made this statement Whatever good and valiant deeds may have been done in church or state by any of the long line of proprietors who sleep in the churchyard of Playford, we are sure that none contributed more to diminish human misery or toiled with more energy and determination to protect the weak and redress oppression than he did. If we value human energy with the benefits that it confers on the human race in proportion to its disinterestiveness and if the brightest memories linger around the names that have done least for themselves and most for others then assuredly must our sympathies be drawn out to the utmost as we stand over the grave of Thomas Clarkson. A granite obelisk to his memory was erected by his friends and stands in the churchyard. Seven of the abolitionists have been commemorated in Westminster Abbey, it was therefore only right that in 1996 on the 150th year after his death that a floor tablet of Cumbrian green slate was sited in the north choir aisle of the Abbey and dedicated on the 16th September 1996 to the memory of Thomas Clarkson. Sir George Biddell Airy KCB FRS FRAS. He was born in 1801. He was a nephew of Arthur Biddell. When Arthur Biddell first came to live at Playford he was unmarried and was looked after by his house keeper, Mrs Mann. As a young boy George Biddell Airy was often invited to Hill House Farm to spend his holidays. One day to keep him amused and happy Mrs Mann gave him a magnifying glass to examine. He claimed afterwards that it was that which started him off in his interest in physics etc. Quite early on he appeared to be a remarkable mathematical and scientific genius. Largely by the advice of Thomas Clarkson he was entered at Trinity College Cambridge, becoming senior wrangler in 1823. Following the tenure of several University Professorships including being in charge of the Cambridge Observatory, he went to Greenwich in 1836 as Astronomer Royal which post he held for nearly 50 years. In the forefront of European science he received the highest honours both at home and abroad. In 1872 by the personal command of Queen Victoria he received the KCB having on three previous occasions declined the honour of Knighthood. In 1875 the high honour of the Freedom of the City of London was conferred upon him. On January 2nd 1892 he died aged 90 years. A plaque to his memory is in Playford Church. The Hall mentioned in the Domesday Book was little more than a farmhouse with farmland adjoining but was occupied sometimes by the Lord of the Manor. 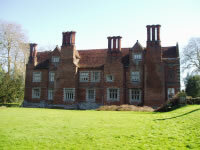 The present Hall, the remains of a larger Elizabethan Hall, is situated in lovely grounds on the south side of the river Fynn. The house is surrounded on all sides by a moat. The hall was rebuilt by Sir Anthony Felton in 1595 and a bell in the roof bears the inscription of his name and date. The Hall formerly formed three sides of a hollow square with a colonnade on the south side. Some of the column bases are still visible. The house slowly fell into disrepair but was restored by Thomas Clarkson in 1816. Prior to that date the house and farm were occupied by John Cutting. It is said than an old man by the name of Husselton who died about 1840 told Mrs Clarkson that he remembered when a boy a chapel being attached to the east of the present dining room and meeting the North side. He remembered the chapel being taken down. Royalty lived at Playford Hall in 1821/2. Miss Rosa Crisp and Miss Emma Crisp lived at the Hall before the war. During the war the Hall was requisitioned by the armed forces including the Americans. Since then the following have lived there:- Mrs Philip Cobbold and her daughter Mrs Batt, Sir William Aitken and Lady Aitken, Col and Mrs Cardiff and now Mr and Mrs Innes. The peacefulness and serenity of the beautiful gardens and grounds must be experienced. These are often opened to the public in the summer in aid of various charities.